CNRS archeologists have recently provided proof that the Duzdagi salt deposits, situated in the Araxes Valley in Azerbaijan, were already being exploited from the second half of the 5th millennium BC. It is therefore the most ancient exploitation of rock salt attested to date. 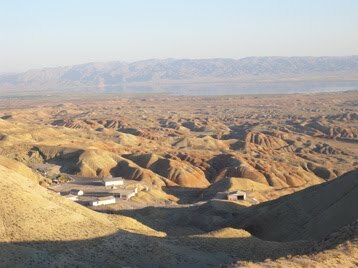 And, to the researchers' surprise, intensive salt production was carried out in this mine at least as early as 3500 BC. This work, conducted in collaboration with the Azerbaijan National Academy of Sciences and published on 1st December 2010 in the journal TÜBA-AR, should help to elucidate how the first complex civilizations, which emerged between 4500 BC and 3500 BC in the Caucasus, were organized. The economic and symbolic importance of salt in ancient and medieval times is well known. Recent discoveries have shown that salt most probably played a predominant role in protohistoric societies, in other words those that preceded the appearance of writing. How is salt obtained? The two most widely used techniques are based on the extraction of rock salt, in other words a sedimentary deposit containing a high concentration of edible salt, and the collection of sun-dried salt in salt marshes, for example. Knowledge of the techniques used in former times to exploit raw materials such as salt, obsidian or copper enables archeologists to deduce essential information on the needs and the level of complexity of ancient societies. In the Caucasus, the first traces of intensive exploitation of rock salt appeared at the very moment when these protohistoric societies were undergoing profound economic and technological changes, particularly with regard to the development, for the first time, of copper metallurgy. In order to understand these interactions, CNRS researcher Catherine Marro and her team have been exploring the Araxes basin (Turkey, Iran, Azerbaijan) for the last ten years or so. The archeologists have been focusing particularly on the Duzdagi salt mine situated in Azerbaijan, more specifically beside the old medieval Silk Road linking Tabriz (in the north west of Iran) with Constantinople. Until now, the oldest traces of exploitation of this deposit, which is still in activity, went back to the 2nd millennium BC. This dating was based on the fortuitous discovery in the 1970s of an ancient collapsed gallery that contained the remains of four workers buried with their tools. In 2008, a French-Azerbaijani team directed by Marro and her colleague Veli Baxsaliyev began a systematic exploration of the Duzdagi mine. The team then made an inventory of a large number of remnants (tools, ceramics, etc. ), the oldest of which date back to 4500 BC. It is the first time that artifacts from this period have been discovered in such large numbers in a salt mine. The researchers have thus been able to demonstrate that exploitation of this salt mine has been going on for a very long time, extending back at least to the second half of the 5th millennium BC: Duzdagi is therefore the oldest exploitation of rock salt known to date. Another remarkable fact is that the abundance of artifacts dating from the early Bronze Age suggests that the Duzdagi mine was intensively exploited from as early as the 4th millennium BC. Hundreds of stone picks and hammers have in fact been found near the entrances of collapsed tunnels. The frequent presence nearby of ceramic pottery fragments specific to the culture known as “Kuro-Araxes” has made it possible to date these archeological artifacts. Their spatial and chronological distribution was analyzed by a geographic information system, combining satellite photos (Spot 5), aerial photos taken from a kite and the plotting of artifacts by DGPS, a sort of enhanced global positioning system. Such intensive extraction suggests that the salt from Duzdagi was not limited to local use by small self-sufficient communities. It was undoubtedly distributed, within a still unknown economic framework, to more far-off destinations. Furthermore, it appears that the extracted salt was not accessible to all of the communities in the Araxes Valley. Its exploitation from the 5th millennium BC seems to have been the prerogative of certain prominent groups. This work raises a lot of questions. Who and what was the salt intended for in the 5th and 4th millennia BC. How were the communities that exploited these deposits organized? What were the political and economic links between the different regional sites (villages, workshops and mines), etc.? To find part of the answers, the archeologists hope to excavate the collapsed tunnels of this deposit, which covers more than 6 km2, in the near future. WHERE ARE ALL THE FLOWERS FROM?